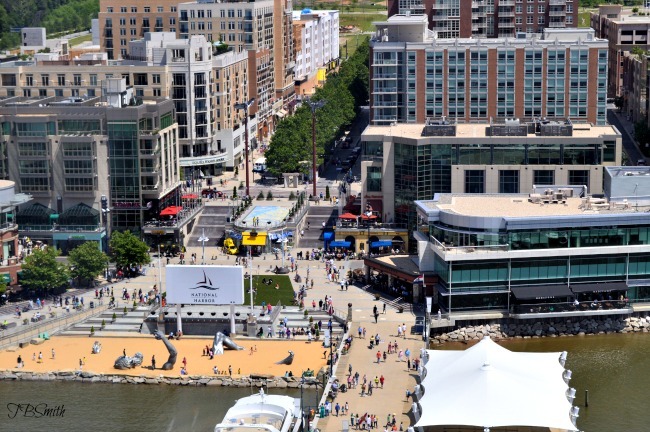 Several new attractions and restaurants were added to the National Harbor footprint since I first visited the waterfront in 2008. 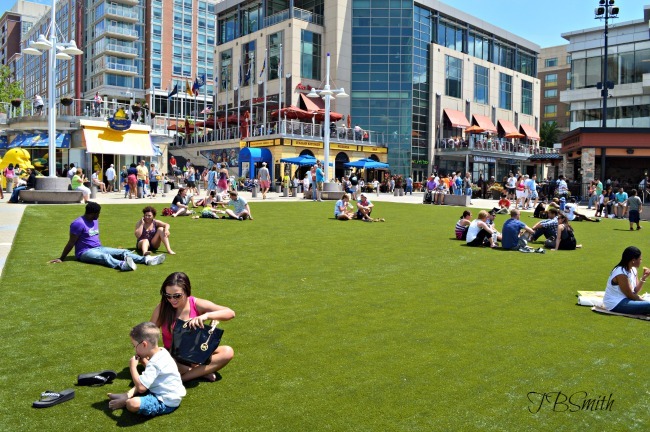 At the time, I don’t think there were 5 things to do let alone 10 things to do at National Harbor with kids. We were limited to hanging out at the hotel, visiting the Peeps store, visiting the Awakening sculpture, eating and strolling the waterfront. Today, it’s exciting to see that families visiting National Harbor have more options. As development of the Harbor nears the end of its original six-year plan, the area offers more diversity for a family’s itinerary. If you decide to visit with your family, here’s a list of some things to do at National Harbor that should keep everyone busy. 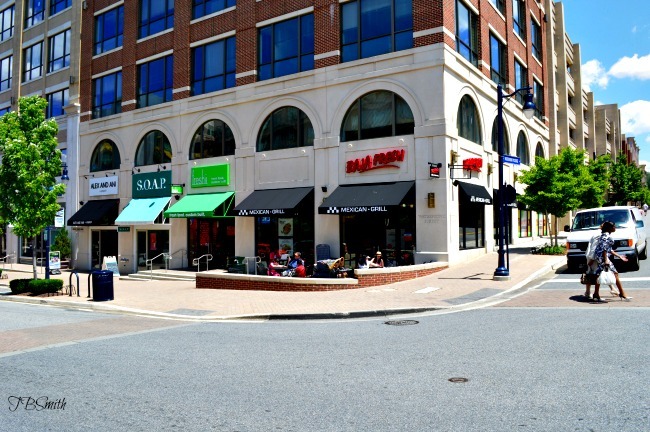 Shopping: National Harbor has its fair share of boutique and major brand stores, over 40 retailers to be exact. You can find everything from wine to shoes to clothes to stuffed bears. And if that’s not enough, drive or shuttle over to Tanger Outlets with 85 more brand name stores. Outdoor Movies on The Potomac (Summer): From May 25th to September 28th, visitors can catch an outdoor movie right in front of the Potomac. On our way back home from our Gaylord staycation we noticed families and individuals gathering on the artificial turf with their blankets and snacks, preparing for the evening movie. Finding Nemo was due to start at 6pm, the run-time for all their family-friendly Sunday movies. Explore Gaylord National Harbor: Even if you don’t embark on a family getaway to the Gaylord, you can still browse around its grounds and see all that the property has to offer. There are four restaurants to dine, boutiques, coffee shop, atrium bar, outdoor garden area, and their hourly music water show. You can also catch a firework display here during the summer. The Capital wheel: Courtesy of the Gaylord, we enjoyed a fun family ride on the Capital Wheel when it was brand spanking new. 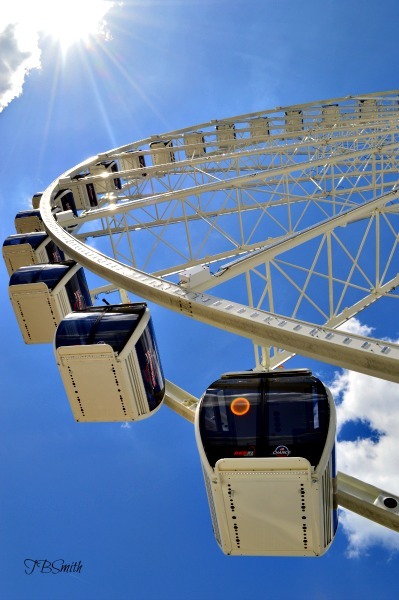 Similar to the London Eye, this gondola style ferris wheel has 42 enclosed climate-controlled cars capable of sitting up to 6 passengers each. The wait can be long on a sunny summer weekend but the payoff is worth it. I was able to get aerial shots of the Gaylord and enjoying a panoramic view of the Potomac River seeing as far as the U.S. Capitol. Total ride time is 15 minutes. The Carousel: Thank goodness the developers thought of this one. I remember wishing there was some sort of play area or park when we visited back in 2008/2009 with my active 4 year-old. That toddler is now 10 years old and although the Carousel and playground may be a little “young” for him, my 6 year-old can still enjoy the area. Admission: $5 for kids, free for adults with paid child admission. 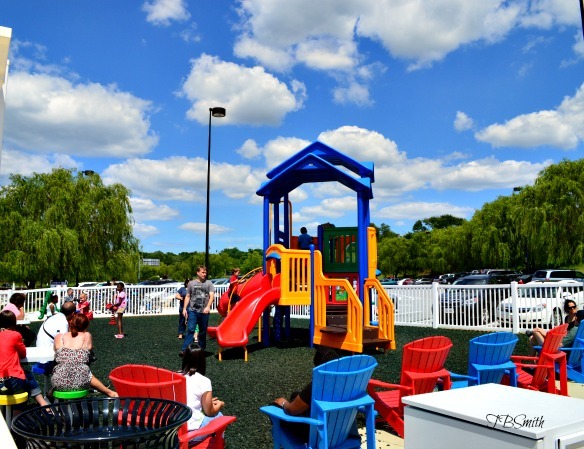 Entry gives you access to the picnic tables, the carousel and the playground. Military personnel receive a $3 all-day pass. Farmers Market: Another summertime activity is the Millers Farms Farmers Market. We stumbled upon it on our way to grab lunch. You’ll find it located by the fountain on American Way, same street as Mayorga coffee shop. The market is open on Saturdays and Sundays from 10am-5pm. We walked away with two bags of freshly popped flavored popcorn that held the kids over until lunch. Cruises and Water Taxis: If you’re staying at National Harbor overnight or longer, take advantage of the water taxi and visit Alexandria by boat. The ride is around 25 minutes and is a relaxing way to enjoy the Potomac. Roundtrip fare for adults is $16, kids 2-11, $10. Tip: Purchase your tickets online for a $2.00 discount. Water Activities: If you’re looking for a smaller vessel or want to be a little closer to the water, you can kayak, canoe, cruise on pedal boats or do stand up kayaking. Boating in D.C. provides all the equipment that you need. They’re located adjacent to the Carousel. National Children’s Museum: Open from Tuesday through Sunday, the NCM is geared towards kids 8 and under with its exhibits and programs. We haven’t been to the museum since it was in its original satellite location, so unfortunately can not speak to its programming. 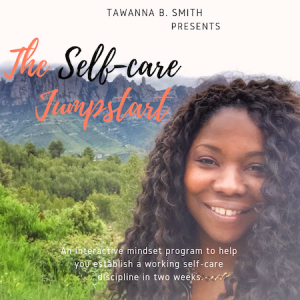 Everyone 12 months and over pay $10 admission. Military and AAA members receive a $1.00 discount off admission. 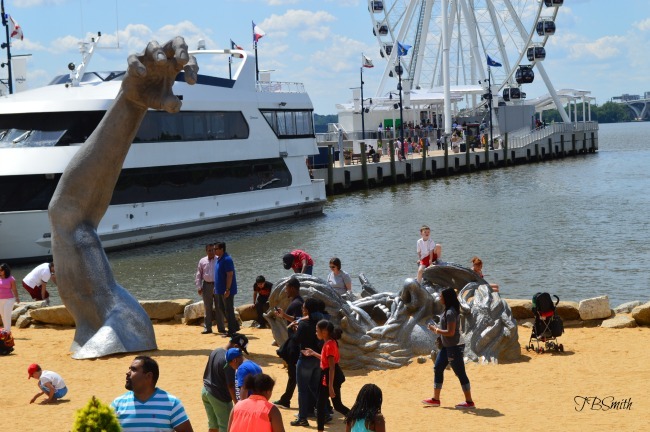 The Awakening: Most kids are attracted to the ginormous cast iron hand and face sculpture erupting from the sandy beachfront along the Harbor’s shores. This makeshift beach play area is a fun place for kids to run around and be free. Note: If you consider all the above activities, there’s a lot more than 10 things to do at National Harbor for adults, including nightlife, bars, wine tastings, a spa visit and more. 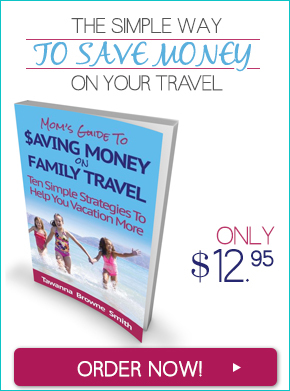 Remember, it’s important to honor travel without kids as well.